Darius Jackson works with teachers on the various professional development programmes provided by the UCL Centre for Holocaust Education. He also oversees the Initial Teacher Education programme offered by the Centre. Darius started at the Centre for Holocaust Education in June 2012, after a varied career in education. He began teaching in 1984 and spent the next 19 years teaching in Gloucestershire and Birmingham, initially teaching economics and social sciences before moving to teach history. He also taught citizenship, R.E. and sociology and spent the last eleven of those years as Head of History in two schools in Birmingham. In 2003 he moved to become Lecturer in History and Citizenship in Education at the University of Birmingham. 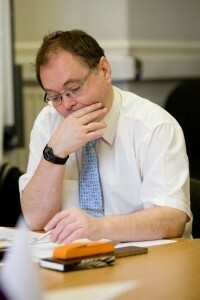 He ran the PGCE in Secondary History and Citizenship as well as working on PGCE RE, English and Primary Education. He also taught on undergraduate education and citizenship courses. In October 2009 Darius was awarded the school prize for “Excellence in Teaching and Supporting Student Learning” as well as being accepted as a Fellow of the Higher Education Academy. During this time Darius also wrote teaching materials for the Jubilee Debt Campaign; Tide~Global Learning; Ireland in Schools Project and the College for International Citizenship course on Political Systems. Darius has been working on widening the provision of the Centre for Holocaust Education, co-developing Pursuit of justice: the trial of John Demjanjuk, a day for citizenship teachers with transferable classroom resources, and on devising professional development sessions for teachers of English. Though his research has focused on the construction of meaning(s) in Holocaust education Darius has also researched into how young children talk about and develop an understanding of time, a concept that underpins children’s development as historians. He is also interested in how professional learning helps to build communities of practice and has researched into mentoring practices for student teachers and other professions. He has an ongoing interest in using Activity Theory to study what actually constitutes bodies of professional knowledge.